Vimeo has flipped the switch on 4K/UltraHD streaming, following in the footsteps of other online video giants like Amazon Instant Video, Netflix, Vudu, and YouTube. The feature is currently only available to a subset of its viewers, Variety reports, but will be extended to all and sundry during the first quarter of 2016. Meanwhile, the IAC-owned service is also rolling out adaptive bitrate streaming across the various platforms it’s available on, beginning with iOS and Apple TV. The company says efforts are underway to bring the feature—which allows it to automatically adjust streaming quality based on the user’s Internet connection—to Android, Amazon Fire TV, and Roku in the coming months. The company began flirting with 4K content almost a year ago, when it enabled UltraHD video uploads for anyone with its $200-per-year Pro subscription. Viewers, however, could only download—not stream—such videos at that resolution until now. 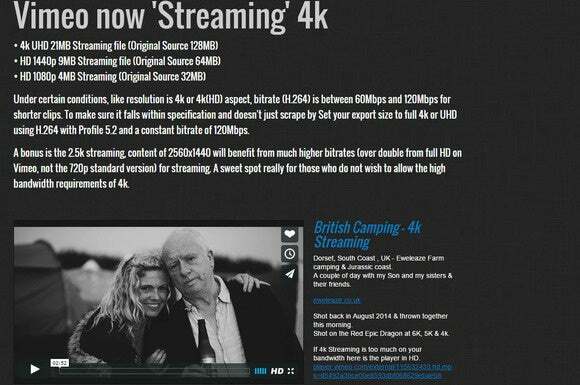 “We launched 4K upload support for Pro subscribers last year, and now, as we start to see more widespread adoption of 4K-enabled screens in the market, we’re excited to roll out adaptive streaming across Vimeo,” the company’s CEO Andrew Pile told the publication. The service—which claims to have a monthly audience of more than 170 million viewers—started out as a rather basic video-sharing platform in 2004, but has since diversified into paid on-demand content. Its “Vimeo on Demand” platform is unique in that content creators can use it to build their own Netflix-like subscription video-on-demand (SVOD) service , in addition to renting or selling individual titles. Why this matters: The demand for 4K content is increasing rapidly as sales of TVs, monitors and other devices that support the new resolution format rise. With the TV industry in no apparent rush to make the jump to 4K, and the first commercially available Ultra HD Blu-ray players and discs still months away, it’s left to streaming services to quench this thirst. They seem only too happy to oblige.